Compatible. Includes two Large Baskets by LocknCharge and a Stainless Steel Device Rack for storing any device. Designed to go where other Charging Stations can't. Baskets by LocknCharge allow you to share and safely distribute the devices that are stored in the Carrier 10 Charging Station, between multiple classrooms. They also enable students to assist in the distribution of devices, so teaching can happen faster. The Baskets are interchangeable with LocknCharge Carts that use the same large Basket ecosystem, such as the Carrier 20 Cart™. New larger Baskets by LocknCharge. The Carrier 10 Charging Station is equipped with larger Baskets, allowing it to fit bigger devices. Now you can store and safely distribute 13" Chromebooks, Macbooks, Tablets or iPad devices. Are your devices still too big for the Baskets? 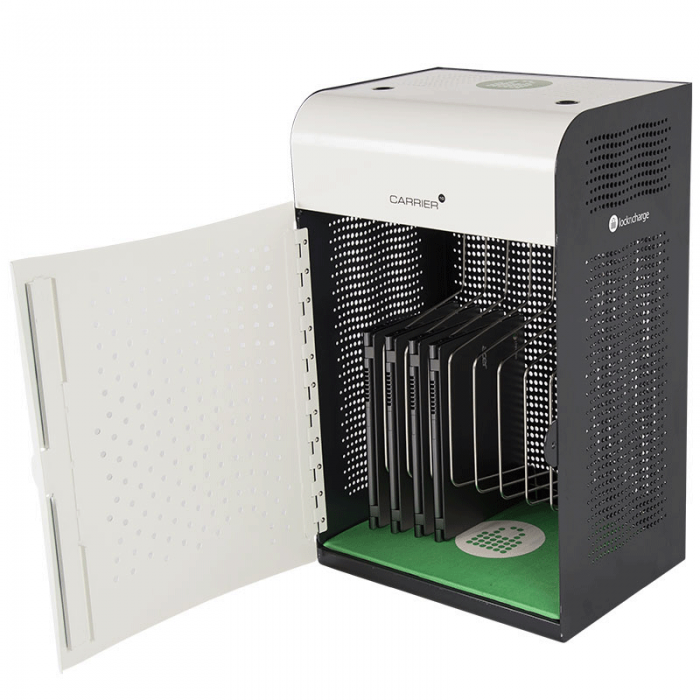 The Carrier 10 Charging Station also includes a Stainless Steel Device Rack. The Rack is designed to accommodate up to 17" Laptops. Easy cable management. LocknCharge cable management has been simplified so that you can wire an entire Charging Station in minutes. Save time with set up and gain time using your Carrier 10 Charging Station. Modular syncing (optional). 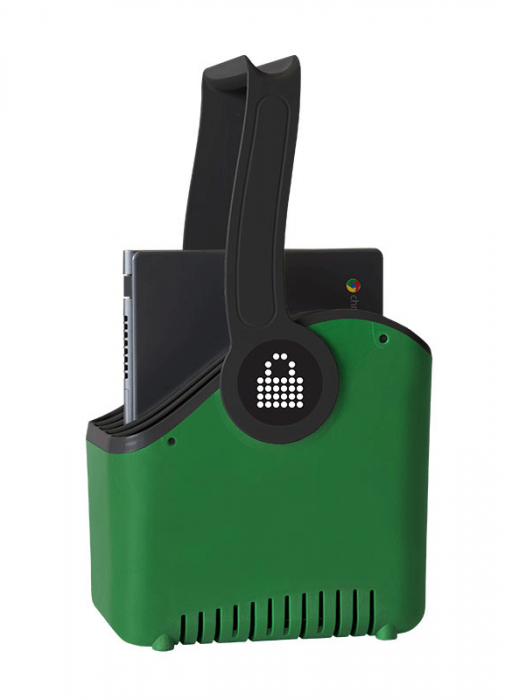 Don't buy a new Sync and Charge Station, purchase the hand held iQ 16 Sync Charge Box™ which allows you to carry the unit to where syncing is required (sold separately). Contact us for more details. How many Large Baskets by LocknCharge come with the Carrier 10 Charging Station? Two. Each Basket has five slots that can fit wide a range of different devices, including 13" Chromebooks and Macbooks. What color are the Baskets with the Carrier 10 Charging Station? What devices are compatible with the Carrier 10 Charging Station? The Carrier 10 Charging Station is designed to fit almost any device - now up to 13" thanks to the Large Basket. But if you're still unsure, there is a simple template that you can download in the section below to determine whether or not your devices will fit. All you have to do is download the file, print it to scale on an A3 size paper and place your device within the guides. Instructions are included on the template. For further information or help, contact us. My devices are too big for the Baskets, what other options are available? We have you covered. 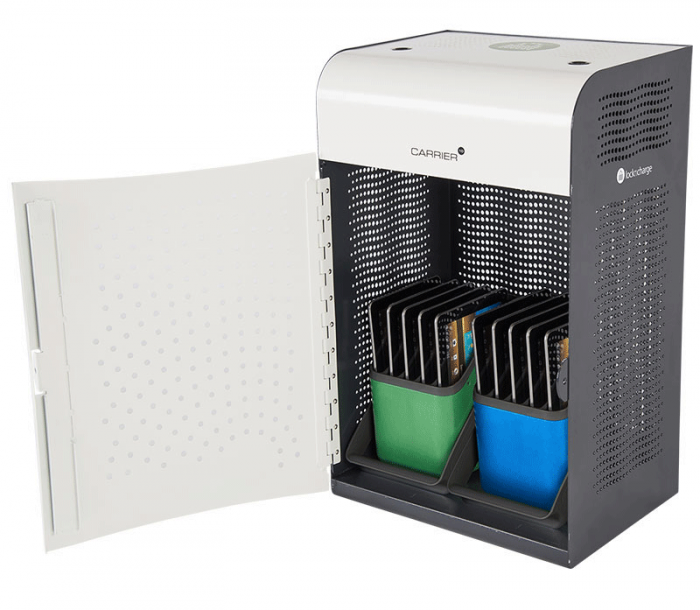 For a limited time, the Carrier 10 Charging Station also comes with a Stainless Steel Device Rack that replaces the Baskets to fit larger devices - full size laptops. Contact us for more details. Can I interchange the Baskets with other LocknCharge products? Yes. The Large Baskets are compatible with; Carrier 20 Cart, Carrier 30 Cart and the new version Carrier 40 Cart.